Who Will Challenge Vishwanathan Anand next year? 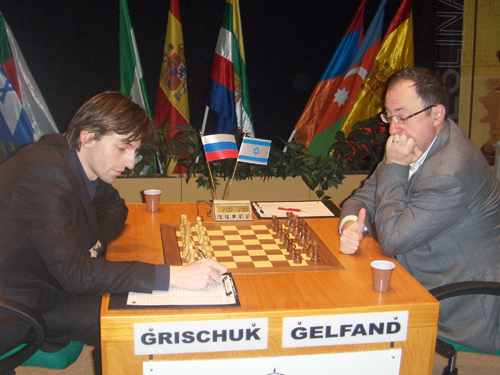 The world title candidates semi-final in Kazan (the capital of Tartarstan) ended with a bizarre shoot-out that saw the G-men of Alexander Grischuk and Boris Gelfand making it to the final on Thursday after beating K-men Vladimir Kramnik and Gata Kamsky. The Kamsky-Gelfand match was swinging to and fro with both players making nervous blunders, the most notable being game 2 with both overlooking a somewhat easy tactical win for Gelfand. But Kamsky was the one to strike first with a beautiful win with Black in game 3, as the US champion all but looked to have booked his passage in the final after trapping Gelfand’s queen in the middle of the board. He easily won that game and only had to draw the final rapid match to get to the final – but in a must-win situation, the Israeli No.1 showed his mettle by outplaying his opponent to tie the scores again. It was then down to the nerve-jangling blitz games, and Kamsky – probably realizing he should really have won the match earlier – was the first to crack under the intense pressure when he first lost his white game, and then having to win at all costs to stay in the match, was again outplayed by Gelfand as he crashed to a second defeat. All in all, it was a dramatic match and the agony was there to be seen in Kamsky’s face during the press conference as he realized how close he actually came to winning. However if Kamsky-Gelfand was an enthralling battle to the very end, then the Kramnik-Grishcuk all-Russian affair took a bizarre twist with a 14 move draw in game two, and in game four worse was to come with 8 moves (exactly the same moves!) followed by a handshake. It was a bold strategy for Grischuk to draw with White to save his energy, but puzzling from Kramnik to accept with so much at stake, and indeed it back-fired for the former world champion as he easily went down to defeat in the first set of blitz tiebreakers. All of which will make Vishy Anand smile back home in India. The world champion’s hopes of retaining his crown in 2012 were already boosted when the world No.2 Magnus Carlsen withdrew as a candidate. Now his other serious challengers, the world No.3 and favorite Levon Aronian is out, and out also has gone his former rivals Veselin Topalov and Kramnik.